Feast Your Eyes On The New Lead Ship. The worlds largest supercarrier bears the name of President Gerald R. Ford who served in the Pacific Theater during World War II. She’s the lead ship as her size started a new class of carriers and she’s full of new age gadgets that also make her the most technologically advanced warcraft in the world. In 2008, the United States Navy awarded the contract to Northrop Grumman Shipbuilding. The carrier was launched on November 9th, 2013 and was commissioned in 2016. Tests are being run as we speak, the crew running drills and ironing out kinks as they go. 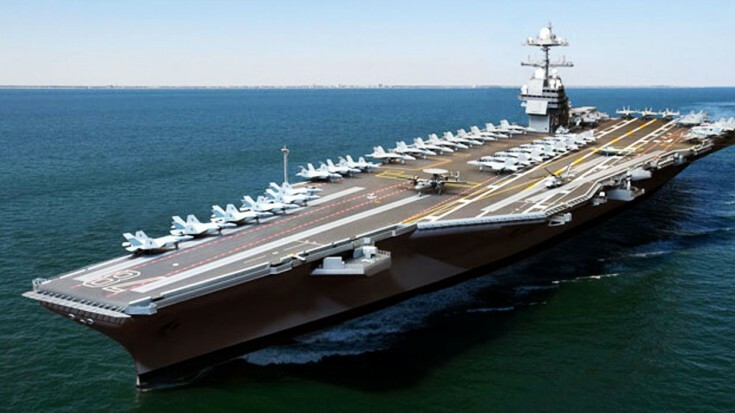 Although this girl is the biggest and most technologically advanced carrier in the world, the price tag reached about $13 billion dollars, with an additional $5 billion in research and development. As for technologies implemented into the ship, the AN/SPY-3 active electronically scanned array multi function radar gives her better range and stealthiness, but it’s her new catapult that is the biggest improvement yet. Replacing the traditional steam catapult, an Electromagnetic Aircraft Launch System (EMALS) will be launching aircraft. This implementation frees a tremendous amount of room below deck, but more importantly allows the carrier to launch 25% more aircraft. To top things off, it also requires 25% less crew members to do so. Overall, the price tag the biggest ever spent on a vessel, but her operational costs are significantly decreased which equals out at the end. She’s due to enter service in 2017 but until then, check out that electromagnetic catapult we told you about. It’s pretty neat.